← Confirmation hearings – then and now. Time was, e-mail was rare, and all e-mail was exciting. Today’s title phrase channels that 1990’s buzz. Baby boomers and perhaps a few Millennials recall dial-up (!!!) e-mail and AOL (the two were practically synonymous then) and this iconic AOL tagline. In 2018, of course, we’re all drowning in e-mail. Only a fraction of the Inbox merits more than a meh. 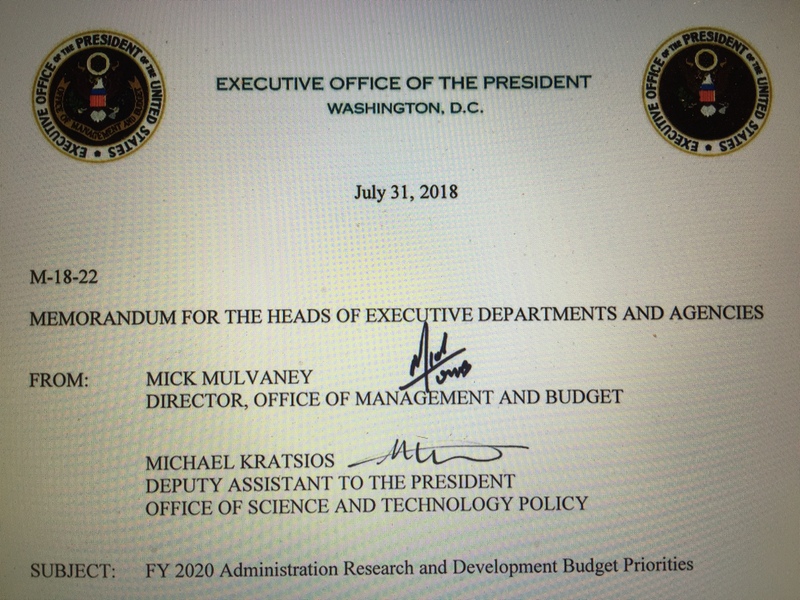 But if you’re scientist of any stripe, one e-mail arrives about this time each year that causes a bit of a stir: an annual White House memorandum, co-signed by OMB and OSTP directors, directed to the heads of executive departments and agencies, and laying out administration priorities for an upcoming government R&D budget. Those agency heads in turn quickly forward it down the chain to their professionals and simultaneously blast it out to stakeholders (including corporate leaders, university research administrators, and the occasional NGO), who pass it along to their respective communities. Sooner or later it finds its way to the likes of you and me. Fueling America’s greatness requires access to domestic sources of clean, affordable, and reliable energy. Unleashing these abundant energy resources will require investment in next-generation energy technologies to efficiently convert them into useful energy services (e.g., light, heat, mobility, power, etc.). Agencies should invest in early-stage, innovative technologies that show promise in harnessing American energy resources safely and efficiently. Federally funded energy R&D should continue to reflect an increased reliance on the private sector to fund later-stage research, development, and commercialization of energy technologies. Agencies should invest in user facilities that can improve collaboration with industry and academia and achieve advancements across the full spectrum of discovery, from incremental improvements to game­ changing breakthroughs. Some priorities appear on only one or the other list. Space exploration. Global climate change. Earth observations. Ocean and Arctic. Other priorities may be labeled slightly differently but clearly are common to both: National security. Information technology. Manufacturing. Life sciences/medical innovation. Energy. The President has stated a goal for the United States to lead the world in clean energy. His Climate Action Plan outlines several key objectives in this domain that should be given priority in the 2017 Budget, including promoting American leadership in renewable energy (including manufacturing for these technologies and a modernized electric grid); unlocking innovation in other key clean energy technologies; building a clean and efficient 21st_ century transportation sector; and cutting energy waste in homes, businesses, and factories. In transportation, there is a particular need to support R&D that can advance multiple transportation modes and fill knowledge and technology gaps. As part of this focus, agencies should also support technology development that has the dual benefit of reducing greenhouse gas (GHG) emissions and bolstering the resilience of our communities. For example, agencies might consider technology development that leverages renewable energy to power water desalination or purification – reducing the GHG footprint of drinking water and bolstering the resilience of communities in drought-prone areas. Up to this point, those hard at work on Earth observations, science, and services might experience an anxious twinge. That portfolio is all about helping the Nation meet its needs for food, water, energy and other natural resources, building resilience to natural hazards, and protecting the environment and ecosystem services. Much of this seems explicit in the Obama-era document, but is less visible in this year’s version.What’s the future for this work? The short answer? Despite the lack of text, still good. By and large, the memoranda priorities aren’t focused on particular scientific and engineering disciplines. They’re essentially silent on the particulars of any physics, or chemistry, or social science breakthroughs needed. But they’re strong on “what’s in it for the American taxpayer footing the bill.” Natural resource needs? They’re tied to national security. (What’s more, the current priorities separately break out agriculture. The text might be light on science, but American farmers are utterly dependent on innovation to maintain their success in international markets.) And environmental and energy needs are joined at the hip; they’re inseparable. Although social science is never mentioned in either year – it nevertheless underpins the whole of any national agenda that happens to (blush!) involve people. Both documents emphasize workforce issues, R&D infrastructure, manufacturing, tech transfer, public private – all activities relating to societal uptake of research advance. So your research, whatever it may be, is always in there, whether explicitly or implicitly. And that’s reflected in budget appropriations, which have been kind to science the past year or so. That reality reflects the R&D document’s dual purposes. It is aimed not at one, but at two audiences. To scientists, the message is an admonition. You’re being funded by taxpayer dollars. Never lose focus on the ultimate societal benefit from your R&D. Good advice! Turned around, the message to Congress and the American public is a marketing piece, touting how the Nation needs and benefits from all science: Innovation is vital to America’s future, and that of the world, and that innovation is needed across the board. This science and technology is our path to get there. You ought to be happy about the work scientists do day in and day out for the Nation. A final thought. From time to time, even the most focused bench scientist – no matter how absorbed in the observations or the equations and models – wonders about the black box that is policy for science (loosely speaking, funding decisions), and science for policy (loosely speaking, how S&T advances inform policymaking, identifying and even expanding future options for maintaining basic American values and achieving universally-sought goals). Scholars work 24/7, year-round on all this. But you and I, even if we spend only an hour or so every few months reflecting on the latest R&D priorities document and its relation to public dialog on jobs, education, health, and security, can gain valuable insight into how we might make our science count, make it more relevant. We can all afford that investment of time. The meh e-mail stack can wait. And we’ll equip ourselves to resolve an existential global challenge: sustainability. More in the next LOTRW post. And of course the 1998 romantic comedy by that name, starring Tom Hanks and Meg Ryan (you can never watch it too many times – thank you, Nora Ephron). Or last year’sfor that matter. As always, Bill, a cogent and thoughtful analysis. Well done. This year’s OMB/OSTP letter perpetuates the myth/misconception that underlies so much of what this Administration is about: everything must be transactional, and must translate to someone’s bottom line. Whether it’s making energy production more efficient, or improving the revenue stream from manufacturing, in the end, the scientific knowledge that will drive it will be based on profit margin. That’s a far cry from how and why our modern scientific “ecosystem” originated, back when Vannevar Bush put together “Science The Endless Frontier”; the idea was that scientific research should be fostered based primarily on its technical merit and contribution to fundamental understanding … not whether there was a buck to be made from it. Several years back the Chief Scientists at five federal agencies wrote an op-ed about this apparent decline (https://www.huffingtonpost.com/dr-richard-w-spinrad/chief-scientists-us-can-r_b_7948522.html) . Sad to see that the trend we identified is only getting worse.